View cart “Wheels that keep on giving” has been added to your cart. 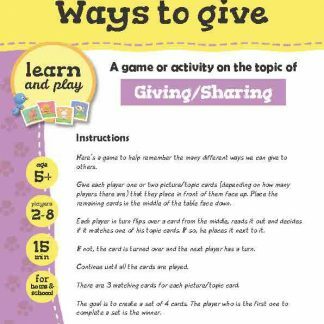 A game activity on the topic of Sharing. Time to play: 10 min. Cut out the cards and divide them evenly between all the players. You’ll notice that some of the cards mention physical things to share and others mention things that are intangible, that you can’t feel, touch or see. Both are important and worthy of sharing. Start by placing the 2 circles in the middle of the table. Each player takes a turn to place one of his cards around the appropriate circle to form a wheel. Keep going until both wheels are complete. Then talk about the differences of these wheels and ways that you can practice both kinds of giving.